The Nigerian Bar Association said the police appeared compromised during the conduct of the September 27 supplementary governorship election in Osun State. In the report by its ad hoc committee on the rerun, the association said the police refused to question the activities of the “fierce-looking men who invaded the area at Orolu” where part of the supplementary poll took place. The ad hoc committee chaired by Mr Tawo Tawo (SAN), stated in its report that the rerun “fell far short of a free and fair election compared to what transpired in the election of September 22”. Ademola Adeleke of the Peoples Democratic Party was leading with 353 votes in the September 22 election which the Independent National Electoral Commission declared inconclusive. But Gboyega Oyetola of the All Progressives Congress came from his second position in the main election to win the supplementary poll and the declared winner in the final results in a "fraudulent" rerun. The NBA, in its report which was published on its website late on Sunday, said the police by their action and inaction, appeared compromised in the rerun election that took place in seven polling units across four local government areas. The report added, “In conclusion, the rerun of the Osun State governorship election fell far short of a free and fair election compared to what transpired in the election of the 22nd of September, 2018 in Osun State which was, however, declared inconclusive. The report noted that all the election materials were made available for the election and the electoral protocols for voting were fulfilled by the electoral officers at the unit. It added, “The situation was brought under control by the security personnel present. “In spite of the seeming and subtle form of intimidation, voters were undaunted as they did cast their votes. The report said at Orolu, where the rerun held in Ward 8, polling units 1 and 4, and Ward 9, polling unit 3, members of the monitoring team were harassed and subsequently arrested. It added, “There was heavy security presence with about thirty armed Police officials at Orolu. “At about 10:00 am, while figuring out how to get to Idiya Polling Unit in Orolu, four Toyota Hiace buses packed with about 50 fierce-looking men, drove in and the men alighted and walked towards the polling unit without any PVC in their hands. 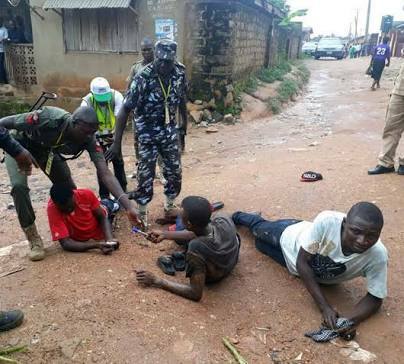 “In spite of the heavy security presence of the Nigeria Police, these men were not stopped nor asked if they were going to vote neither were they asked for their PVCs. “This, however, aroused our suspicion. “A member of the NBA Ad hoc EWG who attempted a recording of the happenings (a few seconds was recorded though) was almost attacked by about six of these men. “Surprisingly, the police officials stood aloof and did nothing to stop the invasion by this group of men. “The reason given by the security men (police officials) for their inaction was that they could not act without formal complaints from us. “Another observation at Orolu was that most of the voters had identification bands on their left arms and ring bands on their thumbs. Those with the said identification bands were allowed access into Orolu while those without the bands were not allowed access and so could not vote.